The Historic Dubsdred Ballroom is a favorite location for many couples in the Orlando area. Located in a quiet neighborhood, close to Interstate 4 you feel like you are a world away from the hustle and bustle of city life. James and Allison sure loved it. With the historic ballroom, amazing catering, and beautiful views of the golf course, you can understand why they chose it. One of the things that makes a wedding go smoothly is the ability to put together a great team of vendors, who will make your vision become reality. David, with Dubsdred Catering made sure everything ran smoothly throughout the wedding day. 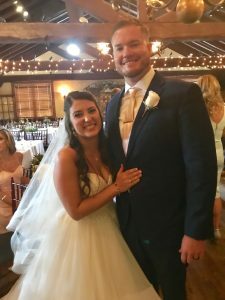 Lee James Floral took all the great ideas that Allison and James brought to him and with his incredible creativity, he created a masterpiece with all the foral needs. He even worked copper into the color of the decorations, since James’ last name is Penny. Less and Vinny with Soundwave Entertainment took great care of the music selections James and Allison made for their ceremony and kept them and their guests on the dance floor all evening long. Rev.Glynn Ferguson with the officiants of Sensational Ceremonies, worked with the couple to create a custom ceremony rich in love and laughter. He gave them a homework assignment to write and tell him why they love each other. Allison wrote: At first I thought it would be difficult to write about why I love James, not because I don’t love him, but partly because I have never been good at putting how I feel into words and partly because I was afraid you’d read this out loud at the wedding. But once I sat down to write this paragraph, it was so easy. James is just such a wonderful person, he is kind and thoughtful, smart and funny, and always down to have a good time. But what it really comes down to is that James is my rock. No matter what, he is always there for me and always knows what I need, even when I don’t. If I have a bad day at work, he knows when I just need a shoulder to cry on and he knows when to crack a joke to make me smile, and he knows if I need a glass of wine or a whole bottle of wine. From the beginning, he has always supported me and my dreams. When we first started dating, I took a new position that required me to work night shift which meant we would work opposite schedules. And then when I decided to go to grad school, I knew that would mean my free time would now be dedicated to studying and school work. But James never wavered and supported me the whole time, even when I thought I would never make it through. So, I know we can handle anything and everything life throws at us, I’m so happy to have him by my side and I’m so excited to spend the rest of our lives together. I love you because I knew it as soon as we started dating. There was never a doubt, never a hesitation, I just knew… And I’ll never forget the moment when I knew you knew it too. I love you because you love anything Harry Potter and everything Wiener Dogs. I love how your first words on a Saturday morning are always “I’m hungry”. I love that you love brunch. I love that you tolerate my antics…and the antics of my friends. I know we are a handful. I love your commitment to finishing school this past year while working full time. You never fail to impress me. I love how quickly you embraced my family, and them you. I’m often convinced they like you more than me, and I’m okay with that. I love your competitive spirit, our weeknight Jeopardy showdowns, and the way you yell “Do Better!” at our Seminole football team. I love that you’ve picked up golf, and even sometimes listen to my coaching. I love that YOU are the detailed itinerary to my vague plans and ideas, but you’ll also let me “just wing it”. Today is the best example of all the beautiful details that wouldn’t be possible without you in my life. I love you Allie. I am beyond lucky to call you mine and I am so excited for our future together. Congratulations James and Allison. We wish you happiness for a lifetime.